Nabi Samuel. Nebi Samwil. Al Nabi Samuil. The Tomb of the Prophet Samuel. Many are the variations of the name for this place. About 200 people also call this place: home. And many more do so from afar, because the buildings that survived the Israeli occupation of this hilltop in 1967 are no longer big enough for all of the Nabi Samuel, Palestinian community. In each of these buildings, three to four families may live together. The principal and one teacher of the single-room school walked us, two Ecumenical Accompaniers, through the community on 1 March 2011. This is a key hilltop in history – dating to the Crusaders and Saladin in the 10th through 12th centuries (Common Era). This importance is due in part to the location with its clear view of Jerusalem to the south. In addition, this place is associated with the ancient burial place of the prophet Samuel. Revered by Judeo-Christian and Islamic traditions, a monastery, a mosque, and a synagogue had all been built here by the 16th century. 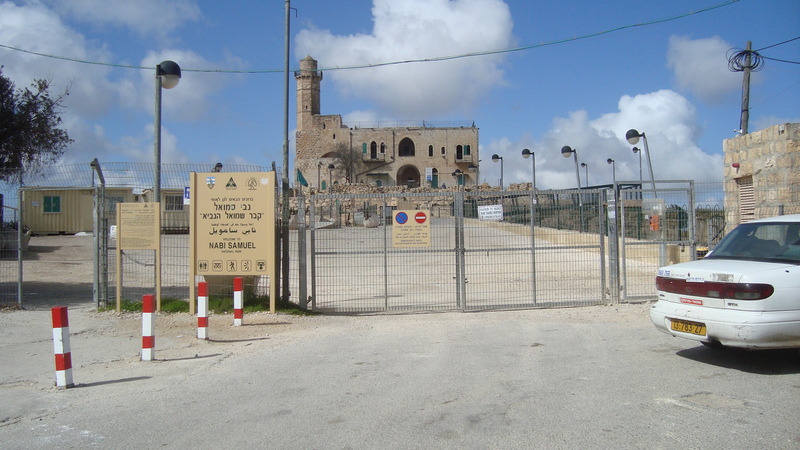 In the Israeli occupation of the West Bank, Nabi Samuel is a place of tension and destruction. In 1971, the village buildings surrounding the mosque were demolished. Palestinian residents fled to the eastern part of the small plateau and a dozen buildings there, and beyond, as far as Jordan. Since then, part of the mosque has been turned into a synagogue. The building stands like an island surrounded by an archaeological excavation site and a fence. 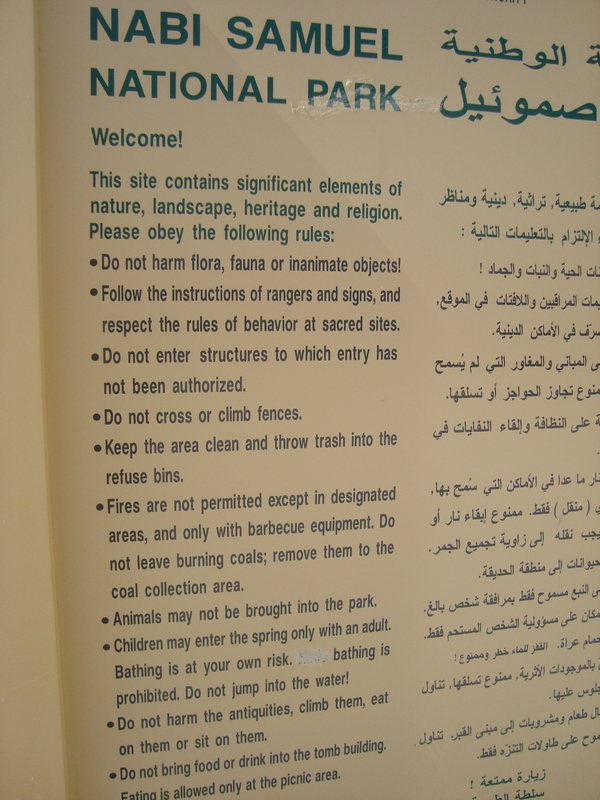 A sign with rules outlines acceptable behaviour of all visitors, including the people of Nabi Samuel. 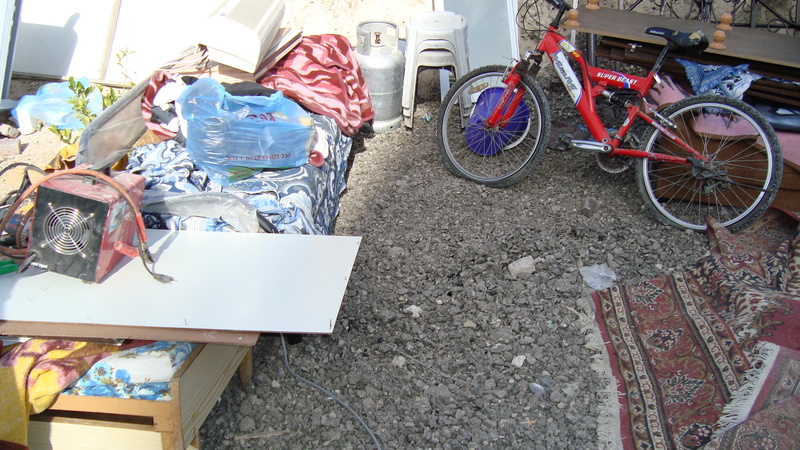 As we learned in early March 2011, only older adults and some families who have living space remain in Nabi Samuel. 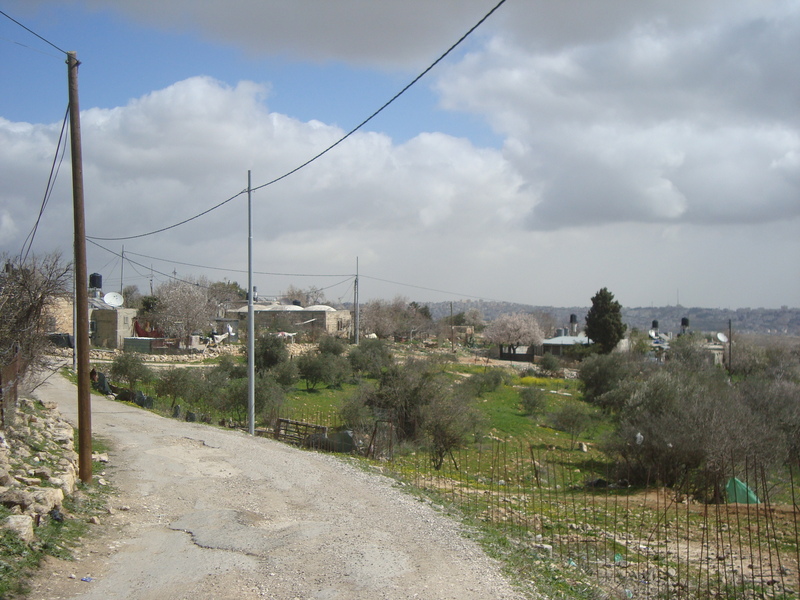 The village is located in Area C in the West Bank, according to the Oslo Agreement of the 1990s (click here). This means that the Israeli government has planning, building, and military control and has not permitted any new construction. The community does not have any health clinic or facilities. The school is only a few square metres. The village council has applied to build an additional schoolroom but has been denied that permit. 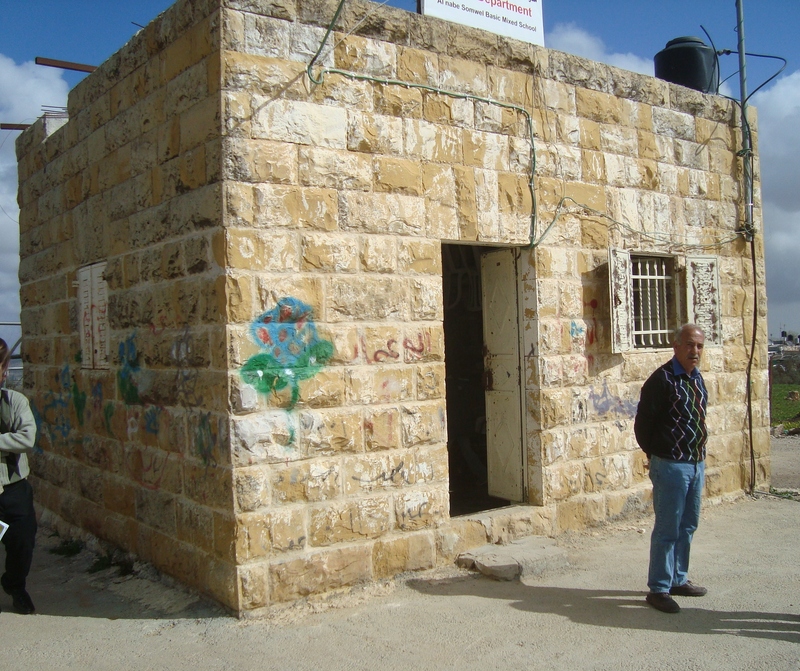 A small, lean-to like bathroom was built on an outer wall of the school; it was demolished by the Israeli authorities. Currently, a re-constructed bathroom exists but remains unfinished – a result of living in the limbo of Area C. A skeleton of a frame for a shelter, for the children to use when playing outside at recess, waits for an Israeli permit. Desks and chairs for more than 10 pupils is optimistic in the existing school building. 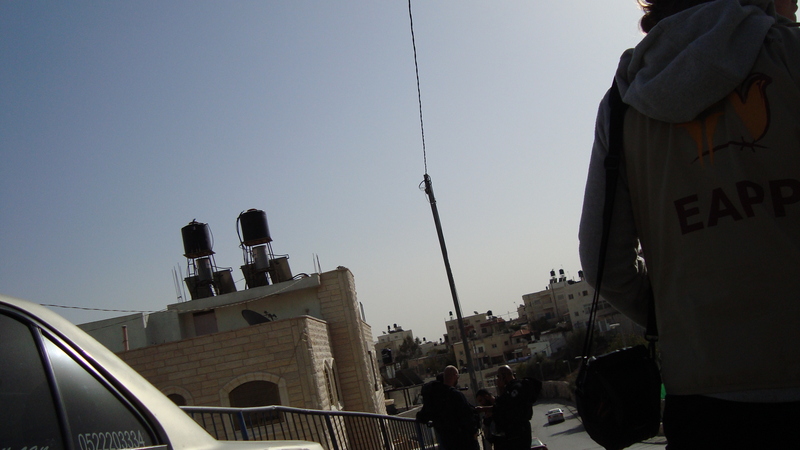 Other Nabi Samuel children travel to different schools with their parents on their way to work into the West Bank. 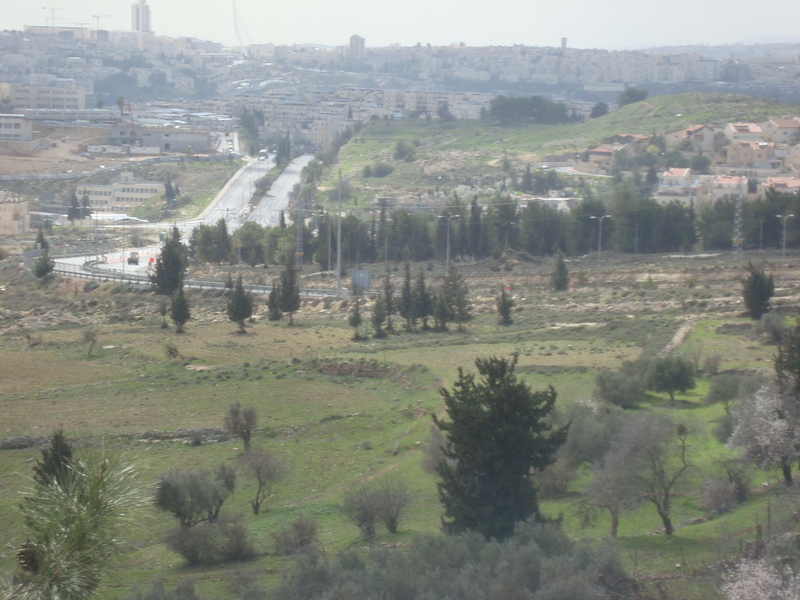 The people of Nabi Samuel can see East and West Jerusalem from their hilltop. Yet, they cannot use the newly built road that skirts the hilltop. They have access to only one road and it leads to an Israeli checkpoint (Al Jib) in a part of the Separation Barrier that is in the West Bank. (The 85% of the Separation Barrier/Wall built inside the West Bank is illegal according to international law.) Israeli settlers alone can speed along the new asphalt from West Jerusalem to West-Bank settlements north of Nabi Samuel. (Settlements are illegal because they are located in the West Bank. This is population transfer and a war crime according to Article 49(6) of the Fourth Geneva Convention. Click here). These settlements are considered to be part of Greater Jerusalem; so, while Nabi Samuel is located within the annexed Jerusalem municipality, it is zoned as the West Bank. 1) A resident with one of the three cars can drive the ill person to the checkpoint. 2) A phone call can be made for a Palestinian ambulance with a West-Bank licence. At minimum, the ill person will wait for three to five hours…if they are fortunate enough that an ambulance actually arrives. How then does this community live each day? Actually, 16 Palestinian communities are trapped in this way due to Israeli government policy and practice. Click here for a recent article. Additional info here and here . “We have no home.” Please note for the 2011 Canadian federal election. How does this connect to Canadians? I witnessed the effects of this demolition. Please read the following account. Then, click here for questions to ask the candidates in your riding leading up to our federal election on 2 May 2011. The questions appear on p. 20 of the 2011 non-partisan Federal Election Kit produced by the United Church of Canada. 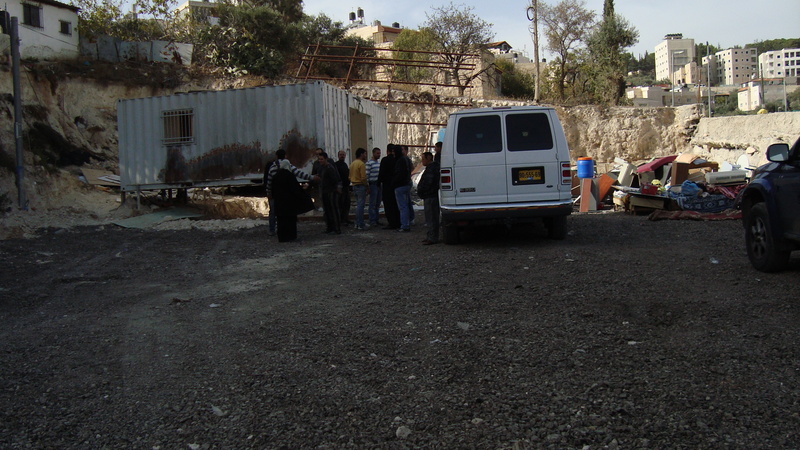 On 21 Dec. 2010, the second day of our term as Jerusalem Team 38, we received news of a home demolition. We arrived in the neighbourhood at 12:30 pm, having been stuck in traffic. We rounded the corner of the perimeter wall of the property and witnessed this. The family, whose property this is, had lived there for 6 years. The home was built in two, joined containers (like shipping containers) and sat on stilts. When we arrived, the family was tearing apart the inside of the house. Soon after, a woman in a car, with the blue letters of the United Nations, arrived and spoke with the family. Thirteen people had lived in the house: the father and mother and their seven children, including two of their grown sons’ families. 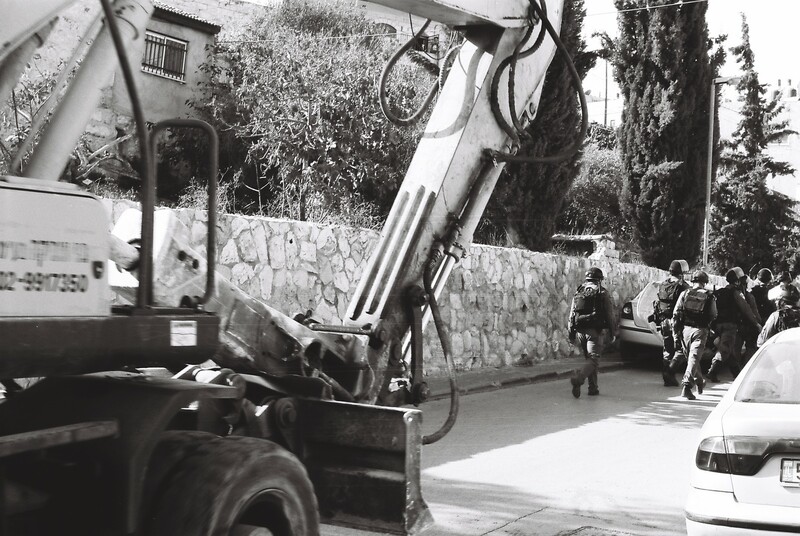 To my shock, we came to understand that it was a forced self-demolition (i.e., under the eyes of the Israeli armed personnel and the Hyundai heavy construction digger). The family had received a written warning 48 hours prior to 21 Dec. 2010. 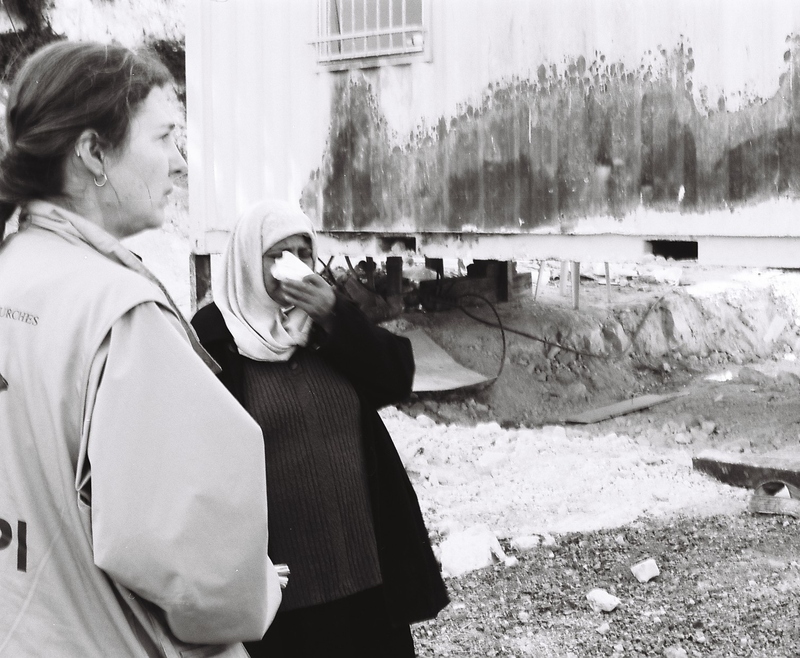 The family had started the self-demolition on 20 Dec. 2010 so that they wouldn’t be charged an additional demolition fee by the Israeli authorities. 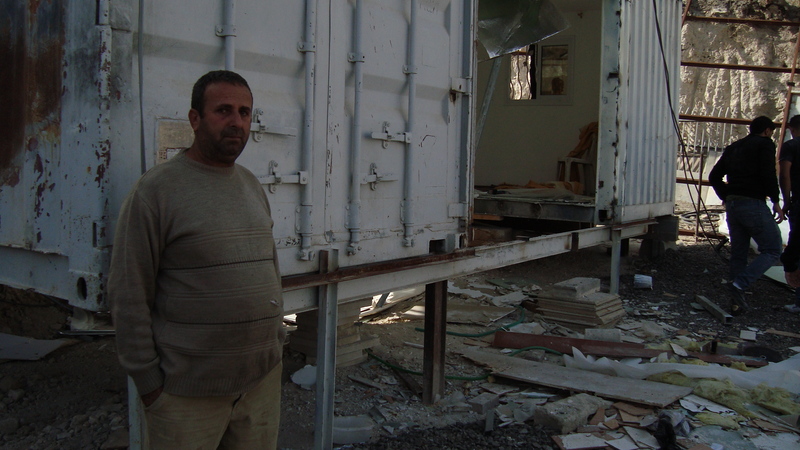 They were told that if they didn’t move the house by the end of 21 Dec. 2010, the Israeli authorities were planning to return on 22 Dec. 2010 to flatten the entire structure. 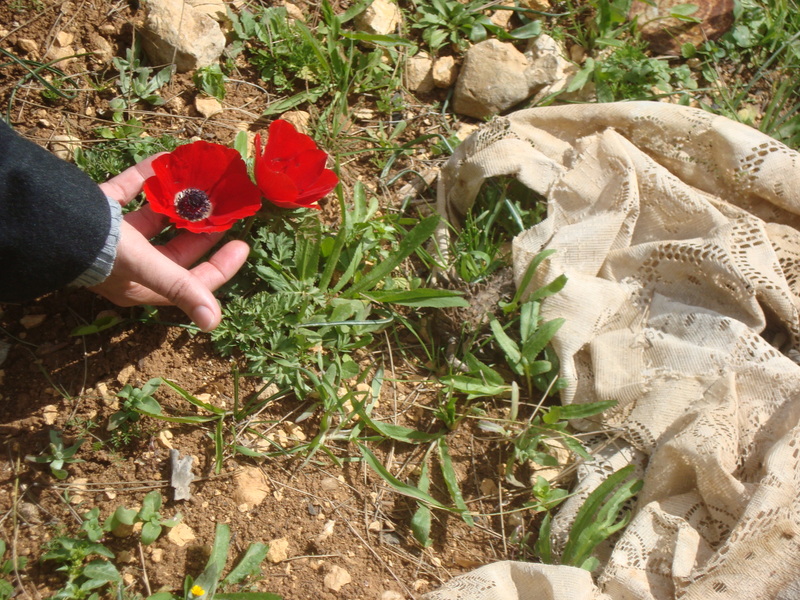 The family had already paid 20,000 NIS (nearly $6,000 CDN) to the Israeli government. If they didn’t move the house, the full demolition would occur and they’d be fined another 100,000 NIS (almost $30,000 CDN). Further, family members would be imprisoned. They planned to move the container by that same night. Some background: Israel occupied East Jerusalem along with the West Bank in 1967. Occupation is regarded internationally as a temporary situation. Permanent changes in occupied territory are not allowed except for military necessity or to benefit the local population (Article 43, Hague Regulations). Destruction of property is not allowed (Article 53, Fourth Geneva Convention). Confiscation of property (Article 46, Hague Regulations) is not allowed. The forced displacement and inhumane treatment (e.g., denying essentials like water) of the local population is…not allowed. However, Israel began its self-declared, illegal annexation in 1967. Using force, it expanded the municipal boundaries of East Jerusalem by annexing 28% of West Bank. 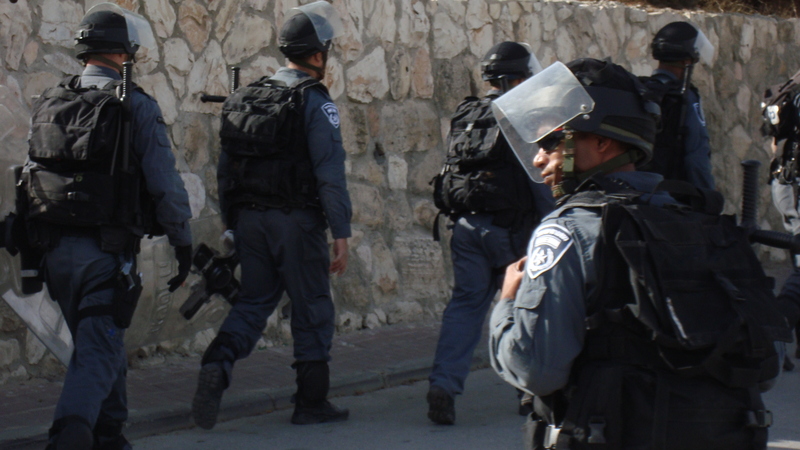 The Israeli government has been moving its citizens into occupied East Jerusalem. This is population transfer and is a war crime [Article 49(6), Fourth Geneva Convention]. The Israeli government’s construction of the Separation Barrier (Wall) to the east of the internationally recognized Green Line (i.e., the 1949 Armistice line following the declaration of the state of Israel) is also illegal (International Court of Justice, 2004; click here, p. 3). Finally, house and infrastructure demolitions are a war crime because they are a grave breach of the Geneva Conventions (click here and here). And yet, the Israeli authorities declare that homes built without building permits in East Jerusalem are “illegal” structures. Through this declaration, they issue demolition orders. In Jerusalem municipal planning, only 13% of East Jerusalem is zoned for Palestinian construction. Most of that area is already built-up. 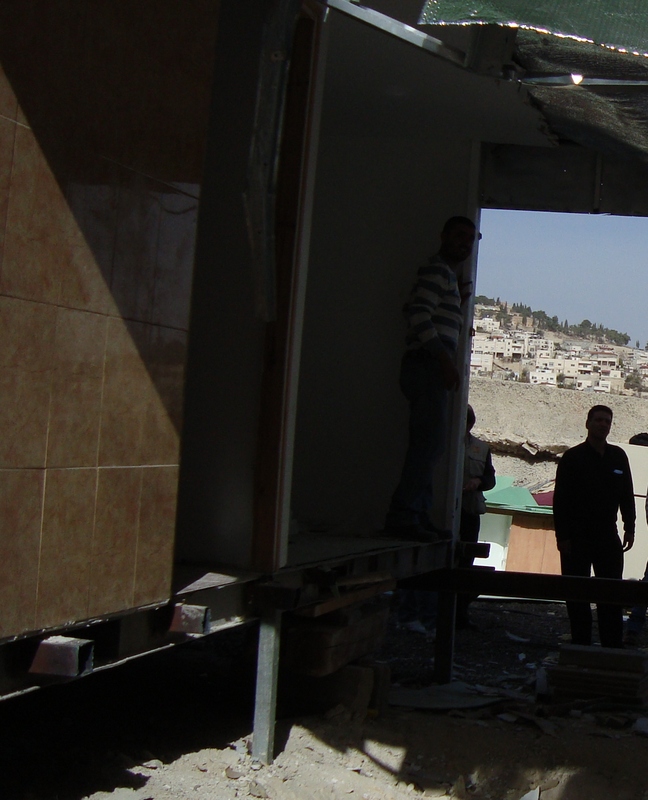 Obtaining building permits for Palestinian construction is practically impossible. To obtain a permit to build or expand a home, a Palestinian may be required to open a land registration file (proving ownership). This may be complicated by refugee status, absentee ownership, and/or partial ownership by the Israeli government. A detailed plan is required demonstrating that the construction will connect with existing public infrastructure (i.e., roads, water). This may be difficult to demonstrate when the Jerusalem municipality has failed to provide that infrastructure. The density allowed is half of what is permitted in Israeli settlements (in East Jerusalem and thus illegal) and in West Jerusalem. Finally, the cost of a permit may be prohibitive. A basic fee (e.g., $25,700 CDN for a small 200 m2 building on a 500 m2 plot) is charged in the application process. And then an additional fee (relative to the size of the proposed construction and the income level of the neighbourhood) will be charged. Together, these fees may be as high as the cost of construction. The process for applying for a permit may also take several years. Many more permits are needed than are granted to Palestinians in occupied East Jerusalem. When asked where they would move the house: “To the street”, one of the older sons said and shrugged. They planned to live in a tent on the property. They felt that if the Israeli authorities were to revisit the property, they could move a tent away quickly. They felt they had nowhere else to go. As we were leaving, a younger son, about 12 years old, arrived from school. He looked stunned and was hanging close to his mother though not able to be with her because she was being interviewed by a journalist. “Will you and your party continue to support United Nations resolutions on the Israeli-Palestinian conflict, which are based on established International Humanitarian Law, in order to secure a just resolution to the conflict? • Will you and your party live up to Canada’s obligations to uphold International Humanitarian Law by condemning acts of violence against civilians by both sides?